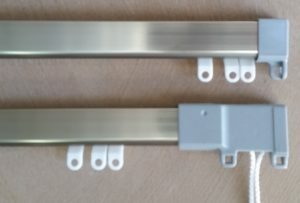 An Aluminium C-section track to suit a Single, Double or even a Triple System. Powder Coated and Anodised in colours to meet most needs. Hand or Cord operation, made to measure for straight and bent window situations. Our Nylon Glass filled, or Metal Leverloc Brackets are designed for easy installation. 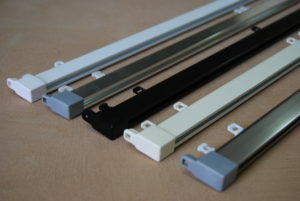 A full range of Kingtrack Aluminium Track Components is available as well as a small range of Accessories that may need in the manufacture of your Curtains and Roman Blinds. These include: Stiffening and Gathering Tape, Velcro, Curtain Weights, Curtain Hooks, Rings, Tie Back Hooks, Cord Cleats and Weights. We also have available components to suit Roman Blinds as well as a small range of Installation product such as Pelmet Brackets, Wall Anchors and Plugs.